A successful Kickstarter campaign brings friends from Pittsburgh to Montana. This is the time of year when many students are breathing a sigh of relief, with classes behind them and the summer ahead, full of potential. 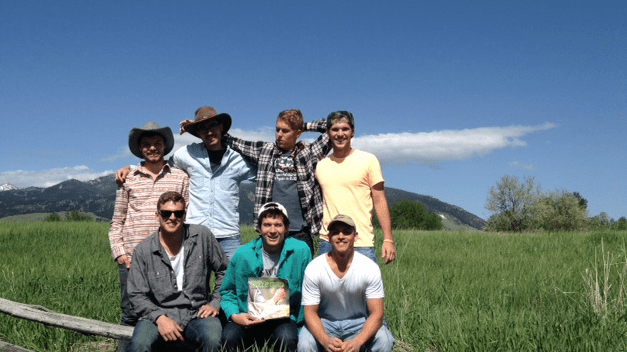 An ambitious group of friends from Pittsburgh, Pennsylvania have decided to make the most of their time between school and their summer jobs with a cross country adventure that leads to Bozeman. What started as an idea tossed around between roommates over their morning coffee has turned into a full fledged project. The group of seven young men, all in their early 20s, were all raised in Pittsburgh and it’s suburbs. They met while attending Grove City College, north of the city. Three of them are graduating seniors while the rest will return to campus in the fall to continue their studies. The group consists of H.B. Mertz, Evan Schnell, Jake Nedley, Peter Holt, David Porter, Stephen Tam and Brandon Moore. The idea for the trip began when H.B discovered that his roommate Tommy Bloom’s family owns a house just outside of Bozeman and someone said “Hey, we should take a roadtrip!”. Bloom has been to the house for ski trips in the winter but has never seen the Gallatin Valley in any other season. Peter has been to Big Sky once to ski but most of the others have never traveled farther outside their state than neighboring Ohio. For Evan, who grew up in the city limits of Pittsburgh, sleeping outside in a tent is something he has never experienced and can’t wait to do. Seeing Montana has always been a goal for many of the guys. They refer to it as “The Wild West” and say they are eager to experience all that Montana has to offer them. Making it even more of an adventure, none of the guys know anyone in the state. In fact, I was the first contact they’d had in the area and they asked for recommendations for restaurants, bars, hikes and other activities. The trip has a loose structure, getting them to Bozeman as quickly as possible. From there they plan to meet locals and have their activities dictated by local’s recommendations. Along the way they plan to camp and visit as many National Parks as they can, including Glacier, Yellowstone and The Bad Lands. The fact that they had free housing gave the trip a focus point and made it feasible. Then they began to focus on the road trip itself, how would they get to Bozeman and more importantly how would they pay for it? The friends say that using Kickstarter to fund their trip began as a joke during a brainstorming session, but they quickly realized there was potential there. They knew that in order to use Kickstarter’s crowd funding platform, they needed a product so came up with the concept of recording their journey with photos and video. The goal is to make a film about their trip that they will enter in a film festival held at their college in the winter. They promoted their Kickstarter campaign via Facebook and through their networks of families and friends. Word spread quickly and they say they’ve received a great deal of support and encouragement. Most adults in their lives say they took a similar trip when they were younger, or wish they had. Two of their grandfathers have even offered to step in as a replacement in the even one of the guys can’t go! Not only was their Kickstarter goal exceeded, they also have backing from three corporate sponsors. This was the result of sending countless emails to local businesses and larger companies, explaining their goal of motivating their generation to get outside and have adventures. A local car dealership (Tom Henry Chevrolet) and a real estate company (Turnberry Associates) have helped fund the trip, making it possible for the guys to travel in a 2012 Chevrolet Suburban. Pennsylvania based Zippo Corp has provided the group with funds and products for their trip. Previously known mostly for their high quality cigarette lighters, Zippo is in the process of re-branding themselves as a maker of outdoor products, which includes windproof lighters but also items such as hand warmers, lanterns and fire starter products, among other things. According to the guys, the company will use footage taken on their trip to Bozeman in their next ad campaign. Besides funds from their backers, the group has also been working together doing landscaping jobs and contributing that money to their cause as well. I spoke with five of the travelers via speaker phone on May 9th, and while their excitement was palpable they were still focused on upcoming final exams. Once the exams were out of the way, they will address their “expensive packing list” and planning would continue. When discussing their project, the guys are adamant in their mission to inspire their generation “to go out and do something exciting”. Several of them expressed feeling that their generation is one of a technological age that often gets stuck inside playing video games and they’d like to see more people their age being active and doing fun things. More than once, one of them referred to the trip as a once in a lifetime opportunity. They also express their gratitude for everyone willing to help them make the trip happen. It is obvious that these young men have worked hard to put this trip together and are excited to see where it takes them. The seven will leave Pennsylvania early in the morning on May 21st and plan to arrive in Bozeman late on the 23rd. Tommy will fly in to meet them a few days later. By the time this article is printed, the guys will be headed home from their adventure, but you can see updates at BozemanMagazine.com. We plan to meet up with the guys while they are in town and post photos to our website along with an update. You can also check their blog at TheRoadToBozeman.blogspot.com, which they plan to update regularly during their travels. You can see the Kickstarter campaign at https://www.kickstarter.com/projects/726298508/the-road-to-bozeman-a-documentary. At first glance, Bozeman may seem like a tourist town with most of the trappings of Anytown, USA but I can assure you it has a spirit that can’t be found anywhere else.